Researchers find that a substance indicating oxidative damage increases in urine as people get older. The study, published today in open-access journal in Frontiers in Aging Neuroscience, also describes a way to easily measure levels of this marker in human urine samples. The new marker potentially provides a method to measure how much our body has aged -- our biological rather than chronological age. This could help predict our risk of developing age-related disease, and even the likely time-frame for our death. While everyone born in the same year has the same chronological age, the bodies of different people age at different rates. This means that, although the risk of many diseases increases with age, the link between our age in years and our health and lifespan is relatively loose. Many people enjoy long lives, relatively free of disease, while others suffer chronic illness and premature death. So, if our age in years isn&apos;t the most reliable indicator of aging in our bodies, what is? Some researchers consider normal aging to be a disease, where our cells accumulate damage over time. The rate of this cellular damage can vary from person to person, and may be dictated by genetics, lifestyle and the environment we live in. This cellular damage may be a more accurate indication of our biological age than the number of years since we were born. Finding a way to measure biological age could help to predict the risk of developing age-related disease and even death. We also need to be able to measure biological age to know whether treatments to slow aging -- which may be possible in the future -- are effective. One mechanism thought to underlie biological aging involves a molecule vital to our survival -- oxygen -- in what is called the free radical theory of aging. "Oxygen by-products produced during normal metabolism can cause oxidative damage to biomolecules in cells, such as DNA and RNA," explains Jian-Ping Cai, a researcher involved in the study. "As we age, we suffer increasing oxidative damage, and so the levels of oxidative markers increase in our body." One such marker, with the catchy name of 8-oxo-7,8-dihydroguanosine -- or 8-oxoGsn for short -- results from oxidation of a crucial molecule in our cells called RNA. In previous studies in animals, Cai and colleagues found that 8-oxoGsn levels increase in urine with age. To see if this is true for humans as well, the researchers measured 8-oxoGsn in urine samples from 1,228 Chinese residents aged 2-90 years old, using a rapid analysis technique called ultra-high-performance liquid chromatography. "We found an age-dependent increase in urinary 8-oxoGsn in participants 21 years old and older." said Cai. "Therefore, urinary 8-oxoGsn is promising as a new marker of aging." Interestingly, levels of 8-oxoGsn were roughly the same between men and women, except in post-menopausal women, who showed higher levels. This may have been caused by the decrease in estrogen levels that happens during menopause, as estrogen is known to have anti-oxidant effects. 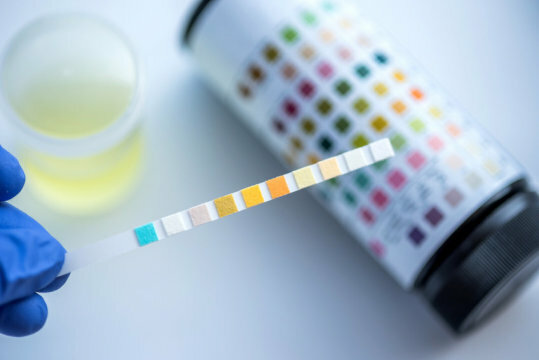 The team&apos;s rapid analysis technique could be useful for large-scale aging studies, as it can process urine samples from up to 10 participants per hour. "Urinary 8-oxoGsn may reflect the real condition of our bodies better than our chronological age, and may help us to predict the risk of age-related diseases," concludes Cai.